This recipe is a delicious way to add greens to your menu. Packed with vitamins and nutrients, asparagus is delicious and can be prepared in many ways. Combine these tender green and white stalks with complements of ham, potatoes, and eggs dressed in hollandaise sauce for a dish that's truly wow. This Belgian favourite is healthy, easy to make and a treat to both the eyes and the taste buds. Watch the video below and see how to use Knorr Mashed Potato to create an innovative side dish for your asparagus. Tip video: Create an innovative side dish for your asparagus! French beans or haricot verts are a great substitute. They’re more affordable, plus their natural sweetness and crunchy texture will blend well with the rest of the ingredients. 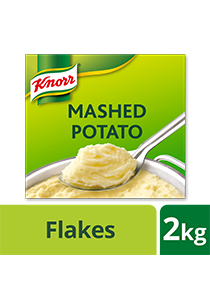 Use small new potatoes and fill with Knorr Mashed Potatoes. Nutritional tip: Did you know? Asparagus is 93% water. It is low in calories and is a good source of vitamin B6. If I don’t have white asparagus, what can I use for á la flamande? Green or purple asparagus will also work with this recipe. Can I make Asparagus á la Flamande without ham? You can substitute ham with any type of smoked fish or other types of cured meats like prosciutto or speck. 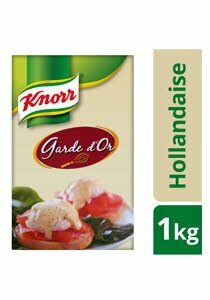 Knorr Garde d'Or Hollandaise Sauce is a delicious and versatile ready to use sauce. Excellent on its own or enhanced by your own creative touch, Knorr Garde d'Or Hollandaise Sauce complements meat, poultry, fish and vegetable dishes. Suitable for use on the stove, in the microwave or bain-marie.